'I can guarantee you that a lot of people in Washington are underestimating my campaign," Castro told NBC News. Presidential hopeful Julián Castro spent Monday touring Puerto Rican communities still needing help from Hurricane Maria and berating President Donald Trump for working "less than part-time" and failing the island. Meant to showcase his stark differences from Trump as well as his understanding of housing issues, Castro's walk and drive through San Juan neighborhoods was his first stop since officially entering the race for the 2020 Democratic presidential nomination. Speaking at a political summit held by Latino Victory Fund, a political action committee, Castro blasted Trump for considering using money designated for Puerto Rico's recovery to build a wall on the southern border, calling it "completely objectionable" and "immoral" and that it "should never happen." He hit back at the president's tweet mocking Democratic legislatorsfor coming to Puerto Rico to attend several conferences, suggesting they were celebrating the shutdown. "I wish the president would spend more time doing the job of being president instead of fighting with people on Twitter and spending so much time golfing and not going to his first meeting until 11 a.m. in the morning," Castro said. "It's amazing to me that we have a president that is not even doing a part-time job, that is putting in less time than the average part-time worker." After his speech and tour, Castro spoke to NBC News about his prospects in what is certain to be a crowded field, challenging those in Washington who think his campaign is a long shot. "I can guarantee you that a lot of people in D.C. are underestimating my campaign," Castro said. "Some people call me charismatic and some people call me boring. Some people say it's not my time yet, and some people say it's past my time, that should have been 2016. Some folks say I'm going to excite the Latino base and some say I'm not Latino enough, but they are missing the point," he said. "The point is that my brother and I have always been able to connect with everyday people of different backgrounds, and they are going to see that in full during this campaign." Castro’s identical twin is Rep. Joaquín Castro, D-Texas, who also serves as his campaign chairman. 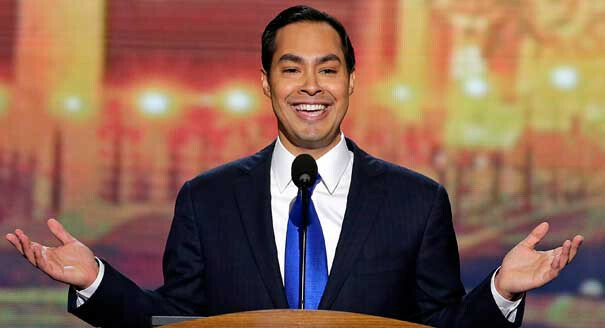 Castro jumped into the presidential race on Saturday, announcing his bid from his hometown, San Antonio. He said he would not accept any PAC money; the campaign paid for his Puerto Rico trip. Puerto Ricans on the island can vote in presidential primaries but not in the general election, since Puerto Rico is a U.S. territory, not a state. But the millions of Puerto Ricans who reside in the 50 states can vote in U.S. elections. Castro toured hurricane recovery efforts in the capital, with San Juan Mayor Carmen Yulín Cruz and former New York City Council Speaker Melissa Mark-Viverito as his guides. Castro, who was secretary of Housing and Urban Development under President Barack Obama, toured an emergency center that had solar power, medical supplies and a water filtration system and was created by residents from the low-income neighborhood of Comunidad Playita, using nonprofit and city funds. A few homes were still using tarps and a 90-year-old man was trying to repaint his home that had been damaged in the September 2017 hurricane. Massive debris was still clogging a waterway. Cruz told Castro that many residents have been unable to get FEMA aid because they can't produce titles of homes that have been passed down for generations. In addition, residents said they were only given funds to rebuild homes from the same building materials that did not withstand the hurricane. Castro said the issue of proving home ownership without a deed or title is one he saw in Native American reservations, too. Sometimes the government lives up to its reputation of being too bureaucratic, but that shouldn't be true in this case, he said. The RNC criticized Castro's visit. "It is disgusting that Julián Castro is trying to further his own political aspirations off of a natural disaster the administration has spent over a year addressing," stated RNC spokesman Steve Guest. But during his visit, Castro said that while challenges with disaster recovery didn't happen overnight, strides were made under Obama that were not followed through. "It looks like we've had a setback here in this administration," he said. Democratic members of Congress were attending a weekend conference held by Bold PAC, the political action committee that is the fundraising arm of the Congressional Hispanic Caucus. In addition, some members of the Latino Victory Fund, a PAC that financially backs Latino candidates, held its political "summit" on Monday, with an agenda that included speeches from Castro and Lin-Manuel Miranda. Lin-Manuel Miranda is in Puerto Rico for a series of "Hamilton" performances to benefit island art programs. His father, Luis, is board chair of the fund. When asked about the criticism over the timing of the visit, several attendees said that while there were receptions and "Hamilton" performances — which they paid for with their own money — they spent most of Saturday in briefings with Puerto Rican officials, including Gov. Ricardo Rosselló, learning about where things stand for Puerto Rico's recovery. "To portray this as like, oh, a party and a holiday, is a very cynical attempt to deflect from a president who wanted to divert disaster relief funds from Puerto Rico into building a wall, which comes from also a very racist, nativist place that's hostile to Latinos," said Rep. Mark Takano, D-Calif., who serves as chairman of the Veterans Affairs Committee. Takano said he learned on the trip that veterans on the island have been unable to get a form of veterans' health insurance coverage because of the loss of health care professionals from the island. Castro said he was headed Monday afternoon to Austin, Texas, where state legislators planned to organize a strategy around his campaign. Then he heads to New Hampshire to participate in Politics and Eggs,a traditional, almost mandatory stop for presidential candidates at which they speak to business leaders and autograph wooden eggs.